Our business has come forth in response to the growing demand for fresh, high quality shrimp grown in a sustainable way. Litopenaeus vannamei, Pacific White Shrimp, will be grown in an indoor, fully recirculating tank, minimal-waste system. This sustainable method means fresh, clean, and tender shrimp will be sold year-round in Greenville, SC! Valeska grew up loving everything about the ocean. For her dissertation, she spent her summers diving and studying the community of organisms that live in, on, and around coral reefs. After physically seeing the toll the fishing industry was doing to the underwater world, she started reading more and more about sustainable fishing methods and became passionate about buying and eating sustainable. After moving to Greenville and learning there was no way for her to eat sustainable shrimp here, she decided to do something about it. And that is the story of how Urban Seas Aquaculture came to life! Austin has always been environmentally conscious, but his love and passion for fisheries sustainability really came to fruit when he started diving with his wife, Val. Seeing how the beautiful coral reefs and the bright inquisitive fishes were being threatened by the increasing amount of aggressive fishing techniques, Austin became a convert for fisheries sustainability. After realizing that Val's idea to start a sustainable shrimp farm in Greenville wasn't just a half baked dream, he was all in! He isn't quitting his day job anytime soon, but as chief science officer, his engineering skills are constantly being put to the test. Talley’s love and appreciation for the ocean took off after her parents gifted her with a chance to get SCUBA certified for her 11th birthday. Since then, her passion has not waivered, and she has invested a great deal of energy to learn everything she can about the oceans’ ecosystems and how to protect them. After graduating in Marine Biology from the College of Charleston in 2015 she traveled around working in different fields of related study seeking a position that offered a perfect balance of stimulating research, active problem solving, and sustainable intention. That’s when she discovered Urban Seas. 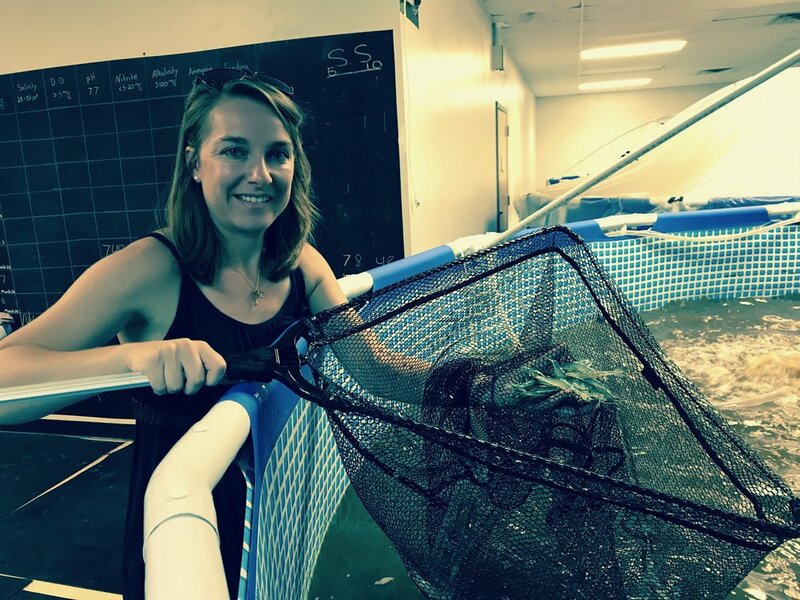 Talley is passionate about fisheries sciences and so excited to be able to work for a business that not only grows shrimp sustainably, but also takes environmental stressors off the ocean. Win win! Urban Seas Aquaculture is proud to collaborate with the Monterey Bay Aquarium Seafood Watch® program to support healthy oceans. The sustainable seafood movement is on the rise and we’re proud our company is at the forefront!